I haven't bothered to replace my coffee maker at home yet. I can't decide whether I want just a basic coffee maker or if I want to scale up and get some sort of coffee/espresso hybrid machine. It hasn't been a huge burden to deal with, because I can usually make coffee at work. That is, until I run out of coffee at work, which is what happened today. Luckily, I had a dollar bill in my wallet, which would be enough to buy a cup of French Vanilla cappuccino from the gourmet coffee vending machine that trolls me at every opportunity. My need for coffee was so great that I decided to risk it. I wish I hadn't. As fate would have it, a full cup of coffee was already sitting in the coffee vending machine when I purchased my beverage. 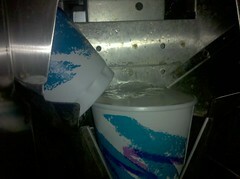 This, of course, resulted in the machine filling the cup that was already there to overflowing, thus denying me coffee. Not the best way to start a Friday morning.